This is a Hand Signed Black and White Publicity Photo 10" x 8" by the late Country Singer. 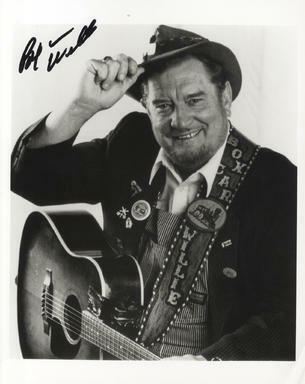 Boxcar Willie, born as Lecil Travis Martin (September 1, 1931 - April 12, 1999) was an American country music singer, who sang in the "old-time hobo" music style, complete with dirty face, overalls, and a floppy hat. "Boxcar Willie" was originally a character in a ballad he wrote, but he later adopted it as his own stage name.